The Radcliffe Institute for Advanced Study brought together scientists, whose research is relevant to obesity and addiction, to investigate an increased incidence of alcohol abuse among those who have had the surgery and, through that, the possible impact of the surgery on the brain circuits that control addiction. A small group of scientists gathered last week at the Radcliffe Institute for Advanced Study to share ideas about a medical mystery: the increasing evidence that some types of weight loss surgery affect not just the stomach, but the brain as well. The procedures, two types of bariatric surgery known as gastric bypass and sleeve gastrectomy, physically bypass or remove a portion of the stomach. Used only for obese patients whose weight threatens their health, the surgeries have proven dramatically effective, reducing patients’ excess weight in the months and years following surgery by 50, 60, and even 80 percent. The procedures were initially thought to work through simple physical means: Patients with smaller stomachs wouldn’t be able to eat as much, allowing them to lose weight and also giving them an opportunity to reform eating habits. James Mitchell, one of the authors of the JAMA study, said research showed that the risk factors for developing alcohol problems post-surgery include pre-surgery smoking, recreational drug use, and regular alcohol use. But in recent years, scientists have noticed side effects of the surgery that hint at something entirely different: that the surgery somehow affects not just the stomach, but the body’s broader metabolism and even the brain. The Radcliffe event brought together scientists whose research is relevant to obesity and addiction to investigate an increased incidence of alcohol abuse among those who have had the surgery and, through that, the possible impact of the surgery on the brain circuits that control addiction. The effect, reported in a handful of studies in recent years, was highlighted in June, when a large survey of more than 1,900 bariatric surgery patients was published in the Journal of the American Medical Association (JAMA). The survey showed that alcohol abuse increased significantly in the second year following gastric bypass surgery and that, among those reporting post-surgery alcohol problems, 60.5 percent hadn’t had drinking problems before. 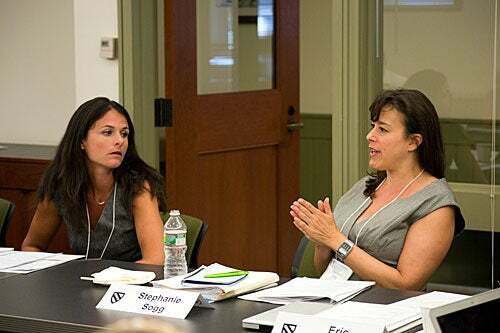 The seminar was organized by two assistant professors at Harvard Medical School (HMS), Janey Pratt, co-director of the Weight Center at Harvard-affiliated Massachusetts General Hospital and assistant professor in surgery, and Stephanie Sogg, staff psychologist at the MGH Weight Center and assistant professor in psychology. The first day was dominated by presentations from the 18 invited scientists on everything from background on the surgical procedures to the use of functional magnetic resonance imaging to monitor brain activity to the latest work on the chemical signals involved in hunger, fullness, the pleasurable aspects of eating, and addiction. The second day focused on future research, with discussion of collaborative projects and potential funding sources. “It was the first time everybody was in one room together. The intellectual energy, it was amazing, one idea launched into another,” said Stephanie Sogg (right), staff psychologist at the MGH Weight Center. Joining Sogg was Nicole Avena (left), a research neuroscientist and expert in the fields of nutrition, diet, and addiction. 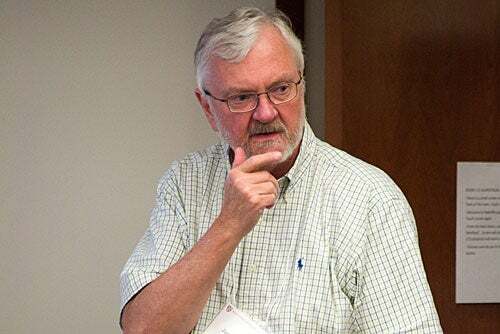 James Mitchell, one of the authors of the JAMA study and chair of the Department of Clinical Neuroscience at the University of North Dakota Medical School, described the results of the recent report and of another published in 2001. The 2001 paper showed that one in five bariatric patients reported getting drunk on fewer drinks and about a third reported getting intoxicated in less time. A number of respondents, concerned about the effects they were seeing, decreased or stopped drinking. The more recent JAMA study showed that the risk factors for developing alcohol problems post-surgery include pre-surgery smoking, recreational drug use, and regular alcohol use, Mitchell said. A pair of researchers from the University of Cincinnati — Associate Professor of Psychiatry Stephen Benoit and research scientist Jon Davis — presented an overview of recent work connecting obesity and addiction. Because people have to eat to survive, many in the addiction field have resisted the idea of food addiction. That resistance has weakened since 2000, in response to studies investigating “hedonic eating” and dopamine release in the brain. Research highlighted by Benoit and Davis showed that leptin, a hormone that inhibits appetite, also affects the release of dopamine, a key player in drug abuse circuitry. Other hormones possibly implicated in linking obesity and addiction are GLP-1, or glucagon like peptitide-1, whose levels skyrocket in patients after bariatric surgery, and ghrelin, a hormone considered a complement to leptin in controlling appetite that is produced in the part of the stomach frequently removed or bypassed in bariatric surgery. “Clearly, being obese is affecting the addiction circuitry,” Benoit said. New research by Davis, Benoit, and colleagues complicates the picture, highlighting how gastric bypass surgery can not only induce excessive drinking in people without alcohol problems before surgery, but can also reduce drinking in people who reported some level of alcohol consumption before surgery. The study, which appeared in March in the journal Biological Psychiatry, surveyed more than 6,000 patients who received gastric bypass surgery and found that a significant number who reported occasional to frequent alcohol use before surgery reported decreased use afterward. The researchers then used lab rats to understand which hormones were involved, showing that GLP-1 is implicated in inducing alcohol aversion while ghrelin can restore the rats’ appetite for alcohol. Ashley Gearhardt, who is set to start as an assistant professor at the University of Michigan in the fall after earning a doctoral degree from Yale University, used the existing psychiatric definition of substance dependence to develop a diagnostic survey for “food addiction,” the Yale Food Addiction Scale. Gearhardt described the scale, already being used by researchers as a tool to diagnose food addiction, and outlined the results of initial studies using it. 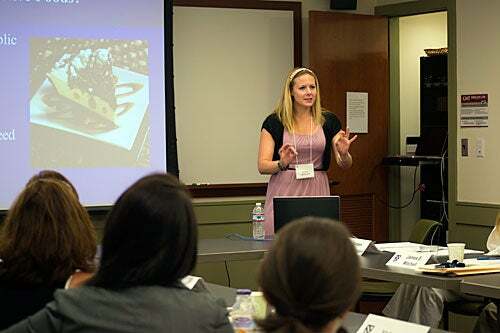 One study of 233 normal-weight, college-aged women showed that 11.4 percent of them met the definition of food addiction, said seminar participant Ashley Gearhardt. One study of 233 normal-weight, college-aged women showed that 11.4 percent of them met the definition of food addiction, Gearhardt said. Researchers also evaluated the scale against similar diagnostic criteria for binge-eating disorder to make sure they’re measuring something different. They found, in a study of 81 obese people seeking treatment for binge eating, that just 57 percent met the definition of food addiction. This finding shows, Gearhardt said, that while there is overlap, the two conditions are separate. In other research, Gearhardt and colleagues demonstrated similarities in brain activation between people who are substance dependent and those with high measures on the food addiction scale. Mitchell suggested that researchers pay attention to cognitive decline and liver disease, because liver functioning has been shown to temporarily decline after surgery and because physicians are starting to see improving cognitive function in patients after bariatric surgery. Obesity has been linked to cognitive decline and an increased risk of Alzheimer’s disease. During discussions about future courses of research, the scientists agreed that weight loss patients should be followed over longer periods of time and that more work is needed on the neural mechanisms linking obesity and the brain. “We have very well worked-out classification criteria for physical disorders like the flu and appendicitis,” Assistant Professor of Psychology Joshua Buckholtz said. “There is an assumption that we have equally well worked-out and valid classification criteria for mental disorders ..."